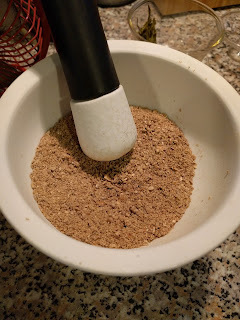 I wanted to find a recipe that didn't require seven batches of grain, so I started on another short recipe elsewhere in scroll seven. 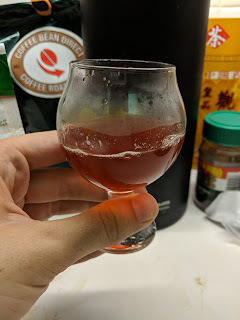 I didn't translate the process for making the yeast cakes because I'm not going to make them, although it seems to be similar to the process for the lumpy yeast cakes I translated earlier, using the same grain mixture. As usual, each sentence in Chinese is followed by my translation in English. 釀白醪法：取糯米一石，冷水淨淘，漉出著甕中，作魚眼沸湯浸之。To make white young wine: take one dan of glutinous rice (Oryza sativa var. glutinosa), rinse it in cold water until clean, strain it and put it in a weng, and soak it in water boiling with bubbles like fish eyes. 經一宿，米欲絕酢，炊作一餾飯，攤令絕冷。Pass one night, and the rice should be decidedly sour; steam it, and once it’s cooked spread it out to cool. 取魚眼湯沃浸米泔二斗，煎取六升，著甕中，以竹掃衝之，如茗渤。Take two dou of the water from rinsing the rice, and boil it with bubbles like fish eyes down to six sheng (0.6 dou), put it in the weng, then take a bamboo broom and assault it, until it is like the froth on boiled tea. 復取水六斗，細羅麴末一斗，合飯一時內甕中，和攪令飯散。以氊物裹甕，并口覆之。Next, take six sheng of water, finely sift one dou of powdered yeast balls, join it with the rice, and after a time inside the weng, gently stir it until the cooked rice is dispersed. 經宿米消，取生疏布漉出糟。After passing a night, the rice will disintegrate; take a new, loosely-woven cloth and strain out the dregs. 別炊好糯米一斗作飯，熱著酒中為汛，以單布覆甕。Take an additional one dan of cooked glutinous rice, and while it’s hot put it into the alcohol until it’s submerged, then take a single layered cloth and cover the weng. 經一宿，汛米消散，酒味備矣。After passing one night, the submerged rice will have dissolved and spread out, and the alcohol’s flavor should have become full. 若天冷，停三五日彌善。If you have cold weather, delay 3-5 days and it will be completely excellent. 一釀一斛米，一斗麴末，六斗水，六升浸米漿。In one ferment, use one hu of rice, one dou of powdered yeast balls, six dou of water, and six sheng of the boiled-down rice water broth. 若欲多釀，依法別甕中作，不得併在一甕中。If you want to ferment more, follow these procedures in other weng, don’t combine them into the same weng. 四月、五月、六月、七月皆得作之。The fourth, fifth, sixth, and seventh months are all good for making this. 其麴預三日以水洗令淨，曝乾用之。Three days in advance, take the yeast cakes for this recipe, and using water wash them until they are clean, then air them in the sun until you can dry them. 經一宿，米欲絕酢，炊作一餾飯，攤令絕冷。Pass one night, and the rice should be decidedly sour; steam it, and once it’s cooked spread it out to cool. It's surprising to me that the wine would be sour at all. At first, I had translated it as "and the rice should be not at all sour" because a modern meaning of 絕 (jué, sixth character from the start) is "by no means," but neither Student's Dictionary nor Wang Li's Dictionary give that meaning. Instead, they both give meanings like "especially," "decidedly," "definitely," along with some other meanings that don't fit this context. I was really struggling with this until I got to the last clause: 攤令絕冷, which if you translate character by character is something like "spread cause jué cold," and there's really no way that this doesn't mean "spread it out until it's quite cool." I think it's unlikely to the point of absurdity that the author of this book would use completely opposite meanings of a character in the same sentence, so I guess we'll have to wait until I can make this to see if it makes any sense. I'm pretty excited to make this. The next step is to make a redacted recipe and go buy glutinous rice. I'm also glad to have evidence of straining using cloth, although again straining at the end of the recipe is not mentioned - maybe they were just letting it settle at the end? It's hard to tell. Edit: nearly forgot! There's a comment in the book saying that this is the method used by the family of someone with the surname Huangfu, who is in the Ministry of Appointments.